Although recent advancements in treatment have substantially improved outcomes for patients with multiple myeloma, some of these newer, more effective treatments are intensive and expensive, leading to continued low use, especially among black patients. To confirm previous findings that showed older patients and those who are racial/ethnic minorities are less likely to undergo autologous HSCT, and assess use patterns of bortezomib among white and black patients, researchers analyzed data from 46,328 patients with multiple myeloma diagnosed between 2000 and 2011 who were included in the Surveillance, Epidemiology and End Results (SEER)-Medicare database. Of those, approximately 84% were white and 16% were black. Researchers found that black patients were significantly younger at the time of diagnosis; however, they were significantly more likely to have indicators of poor performance status (P <.0001) and a Charlson comorbidity index of 1 or greater (P <.001). Black patients were also more likely to be Medicaid beneficiaries (P <.0001). 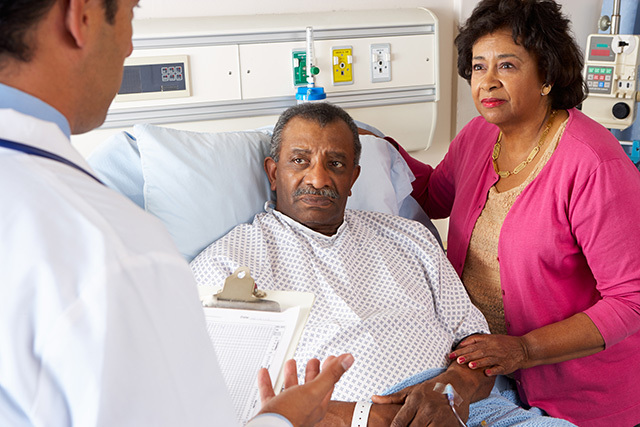 After controlling for overall health and potential access barriers, results showed that black patients were 37% less likely to receive HSCT (P <.0001) and 21% less likely to undergo bortezomib therapy (P <.0001). The underuse of these treatments was associated with a 12% higher risk for death among black patients (hazard ratio 1.12; 95% CI, 1.05-1.19; P =.0007). Investigators hypothesize that differences in medical decision making between black and white patients, in addition to structural barriers in the health care system, likely contribute to treatment disparities in multiple myeloma. Personal preferences or mistrust of the medical system may also be contributing to higher rates of black patients receiving inadequate treatment.